Vacation… cloth or no cloth? 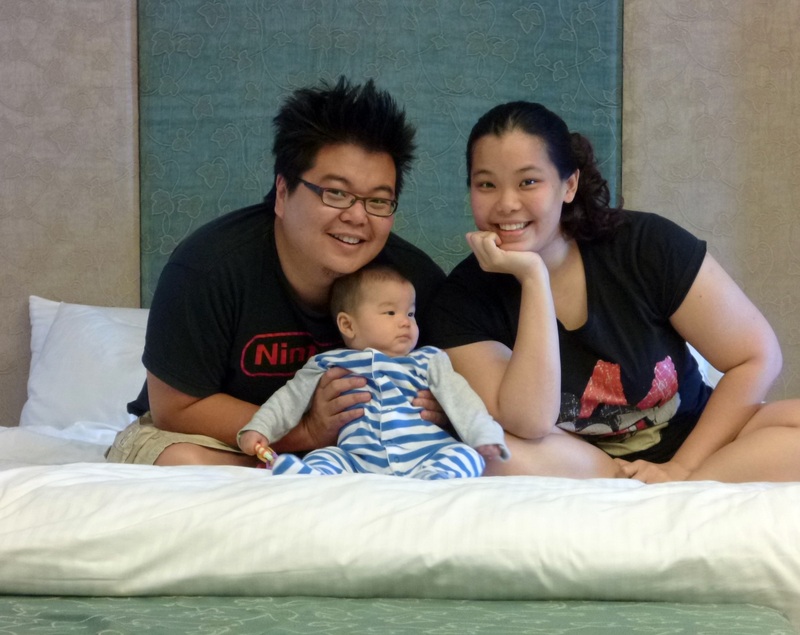 We went for a short trip to Port Dickson for our wedding anniversary and took Leo with us! 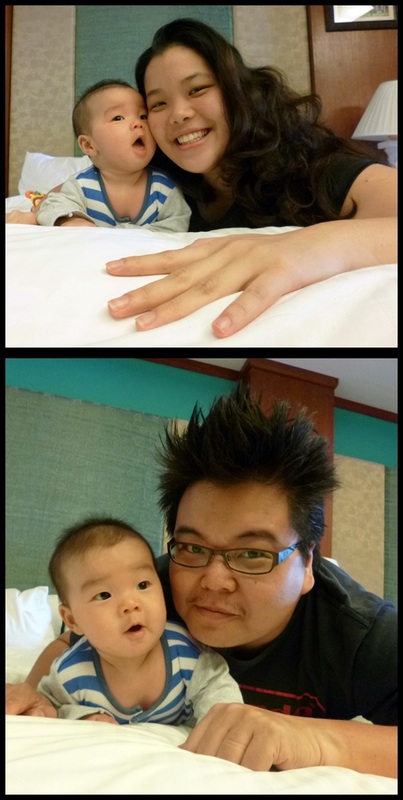 It was our first trip together as a family and I tried to take some pics. Of course, it was not as easy as I thought coz we had no tripod and I also realized we never took a proper photo as a family before… all 3 of us. We did try and most of them are kinda blur coz he was moving and we needed to take it quick, haha! Leo in his “swim diaper” and sun hat! When we were packing, I was contemplating on whether to cloth diaper him or use disposables. So far, he is in cloth all day except at night. Yes, I use disposables at night. Why? Coz I still have a few packs of disposable diapers (which was given to me from other people and I also did buy some when I was pregnant in the early days before I had known about cloth). In which, some I had to give away because he does not fit into size S anymore! Well, I know for sure that once these disposables are done using, I may not buy them at all. I will have to figure out how to use cloth at night for more absorbency. Being away for 3 days means I will have a whole lot of laundry to do when I get back. Our clothes, his clothes, diapers, sheets… ughh! (I do diaper laundry every other day, sometimes EVERYDAY even!) I don’t wanna let my diapers stay stinky for so many days, haha! So I can blog about it and tell people the difference with cloth and disposables when being away. Since I do advocate cloth diapering, it is only fair that I try on disposables to know how the others feel. I packed a total of 20 diapers for the whole 3 days. I really do not know how many diapers we may go through so packing extras is always better. I also brought a small pack of disposable wipes (30 pcs). We came home to an extra 8 diapers and less than half of the pack of wipes. So here are my pros and cons on diapering on disposables. More luggage space. Yes, disposables are SO TINY! They are well packed compared to cloth. I would say if I were to bring 20 cloth diapers, I may need another luggage! Eeekk!!! Costs. Disposables are more expensive in the long run. Now, why I say that? We took him swimming twice during the whole trip and we would put a pocket cloth diaper cover on him as his swim diaper. I would take off the disposable before changing into swim diaper and then put on a new disposable after that. This means I have used 2 diapers already. Maybe I could have reused the earlier diaper? He probably only wet it once (it feels kinda dry but I know he had peed in it already because I can smell it) But I did not. I don’t wanna put a used diaper on him even though it can hold more. With cloth, I did not have to worry changing him as often as I like because they will go into the wash and be reused again. That is a plus for me! I love the fact that I can just change a diaper whenever I want (i.e. I open the cloth to check on him, pee or poo, little or not, I will just change it anyway) Makes sense? Disposable wipes/wet tissues are pretty yucky. Please don’t get me wrong (I use them too!) Leo has been eating puree once a day and his poop is like peanut butter now. Thick and sticky. I find myself using 2-3 wipes each time I clean up a poopy diaper! These wipes are too thin and cannot clean as well. With cloth wipes (I use regular wash cloths – bought two packs of 8 for only RM15), they are so much thicker and wider and I only use one with each diaper change. Those were the only 3 points I felt necessary to mention on the difference between cloth and disposables. I am not saying one is better than the other, they both work great. 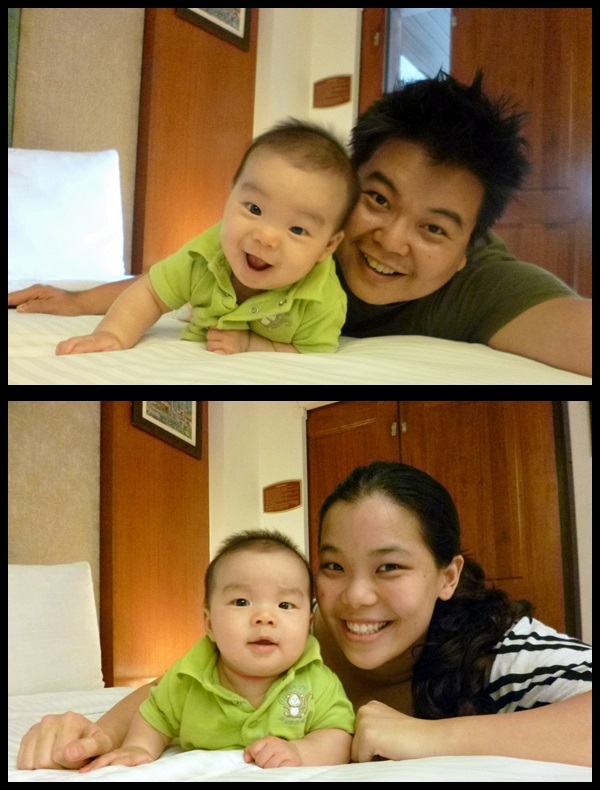 For me, I missed my cloth so much that when we got home, I changed Leo into a cloth and he poops in it immediately, LOL! Maybe if I had gone more days away on vacation, I will use cloth and just wash them there and hang it dry. Why not? It shall be my next experiment to do. It has been 3 weeks since Leonidas started daycare and have been fully cloth diapered there. I am so glad it turned out well and the helpers are favorable over cloth diapers. Then again… we pay them a big amount at daycare, can they say no to what we want? I know in the States there are rules/law at daycare. Some strictly note that only disposables are allowed. They even have rules for milk! (i.e. frozen ONLY or thawed ONLY or bottles must be provided WITH milk inside, etc etc) Thankfully Malaysia does not have such rules/law to state exactly what can or cannot be done. Leonidas is the only baby in cloth diapers at daycare. The other kids are in disposables. When I first mentioned cloth, we did get a confused/black stare from the helpers. Particularly, Rita, one of the helpers. After explaining how it is done, she said ok. It was such a hectic Monday on his first day, we didn’t even have time to explain how to put it on/take off. The difference between and pocket diaper or an all-in-one diaper. We needed to explain how to use a bottle warmer (I’m quite surprised they do not have a warmer! ), what time he feeds, and there was so many distractions! Anyway, they manage to cloth him and didn’t really have much of a problem. I did mention to Rita, that if Leo poops, just throw the dirty diaper into the wetbag and I will wash them at home as usual like I always do. She was so shocked and said that she will not let me bring back yucky poopy diapers. She said that she will rinse them first. Well, I only thought that they may be busy and rinsing isn’t really necessary. Why? 1. I do not want them to think that cloth is such a hassle, because it is not! I wanted it to be easy for them. Take off dirty diaper, put on clean diaper, throw dirty diaper into a wetbag. Just like a disposable… only don’t throw it in the trash, LOL. 3. DETERGENT! After a few days at daycare, I found out that they rinsed diapers smell a little like baby soap. I figured that they rinsed it in soapy water. If you cloth diaper, you will also know that CDs are sensitive to detergents. You should wash them only in CD safe detergent. It wasn’t like a big issue, but I would rather not have them rinse in soap because I don’t want my diapers to repel water. 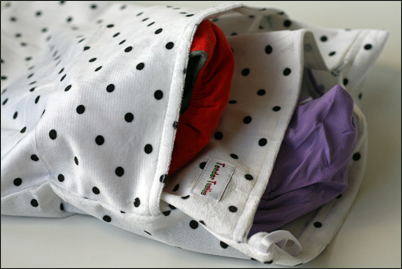 Cloth diapering outside of home is so easy and doable! Let me know if you cloth diaper as well and how did you handle daycare/sitter?